I've finished yet one more version of my Crappie Pole antenna, this one based on KF2YN's ground independent vertical antenna (or C-Pole). See here and April 2004 QST, page 37, for more information. After trimming it a little it measures 1:1 at 14.060 MHz rising to 2.5:1 at 14.35MHz and 1.2:1 at 14.0MHz. I found the choke balun to be key to making this antenna work. With no choke the SWR was over 14:1 at 14.060MHz and with a 10 ferrite bead choke the SWR was still 2.8:1 at 14.060MHz. What I'm using now is 15 turns of RG8X single layer wound on a 4" plastic coffee can. This antenna is about 18' tall, self supporting without guys and has only a 4' x 5' footprint. It breaks down to a bundle 5' long. Physically it looks like a tall skinny goal post. Add a birdie and two racquets and it should fit well into a typical camping weekend. Today I made several nice contacts using my K1 at 5 watts a nd this antenna including W8CQU in Ohio (599), WA3SLN in Pennsylvania (449), W0WCA in Colorado (449), KI0II in Colorado (549) and N4ESS in Florida (579). This antenna is going with us when we go camping this summer. Thank you KF2YN. Update: On June 23 I worked EA6UN on the Balearic Islands off the coast of Spain in the western Mediterranean Sea. That's over 4600 miles on my five watts and this antenna. I found Jurek calling CQ on 14.050 MHz with no responses. He came right back to me and gave a 579 report. A friend of mine noticed that my National SW-4 shown at http://www.prismnet.com/~nielw/nat_list/sw4.htm uses what looks like standard SW3 type audios as opposed to the National "Duo Cou pler" mentioned in the SW-4 ad. 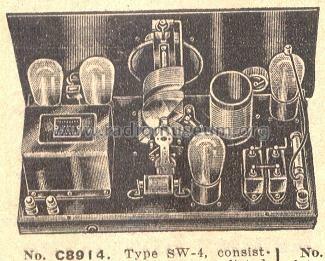 Other National radios show a production process that used parts that were available. Close inspection and comparisons between National receivers of the same model can show undocumented differences in details. Are this audios replacement parts or do they reflect a production change to take advantage of existing stock? As I looked at these audios I saw something else. Close inspection of my SW-4 bakelite chassis showed three large plugged holes and several plugged small bolt holes. Parts mounting and the quality of the work makes it appear that all of this chassis rework was done before most of the parts were mounted. Why all of the extra plugged holes? Was the chassis originally drilled for another product and then reworked? Was the chassis made from a piece of bakelite that already had a few holes in it? Did a worker make several errors that had to be fixed before the chassis could be used? There are a few SW-4s still around. I wonder, do they show similar changes and reworks? Were these sorts of production techniques common or is this really a set that was carefully reworked at some point after it left the factory? This past weekend we had nice weather here in southern Minnesota....mostly sunny and temperatures around 70. I spent some time working on a new portable antenna and then using it on the air. I was looking for something simpler than my 20 Meter Crappie Pole Vee dipole. I decided to try a quarter wavelength vertical. The March 2010 issue of QST has a good article on ground systems for vertical HF antennas. Based on that I concluded that a 1/4 wave length vertical with only 4 elevated resonant radials should perform fairly well. What I ended up with is a 16 1/2' crappie pole on top of a 4' base section. The crap pie pole itself is non-conductive fiberglass. It serves only as a support for the vertical wire. The guys at the top of the base section are 14 gauge stranded copper wire. These are trimmed to resonate on 14.05 MHz and serve as antenna radials sloping from 4' at the base of the vertical to about 1' were they are each tied off with adjustable lines. On Saturday while using this antenna and my K1 I worked WA0FJT in Independence, MO on 14.050. 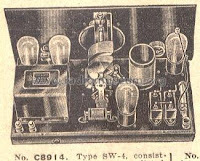 There was some QSB but our 5 watt CW signals were usually 589 both ways. 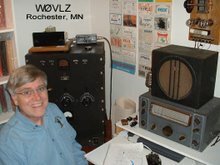 I got on the air again on Sunday afternoon and worked WB4YXD (New Mexico), N4HUS (Arizona), W2LG (Florida) and KB2DHG (New York). All came back to my CQs on a fairly quiet/vacant band. Via email I even received a reception report from W1CTT (Maine).